August 10, 2015 - Heading north on Wednesday! Check back soon for trip reports. For many years we had the idea that the ultimate sailing adventure would be a circumnavigation of Vancouver Island. When we finally set about to acquire the sailboat that could safely do that trip, we found ourselves with a boat that is capable of circumnavigating the Pacific or indeed the world. That boat is the sailing vessel Sequoia. The Vancouver Island trip in 2001 gave us confidence in Sequoia and in ourselves, and that in turn opened up new possibilities. In 2003-2004, we sailed from Oregon, across the South Pacific to French Polynesia, Samoa, Tonga, New Zealand, Fiji, Vanuatu and Australia. Almost every summer, we have voyaged north from our Columbia River home port in Oregon, to Puget Sound, the San Juans, and the island-strewn waters of southern British Columbia. In 2008 we extended our range north to Alaska, reaching as far as Glacier Bay, where we saw fabulous displays of wildlife. In 2010-2011, we took Sequoia to California, Mexico and Hawaii. From Kauai, we headed north toward the Aleutians, and then, when weather allowed, turned east and headed home to Oregon. Since then we've done some shorter trips, closer to home. In August 2015 we're heading north again, toward the San Juans and Desolation Sound. We haven't had a leisurely trip in these familiar waters for many years, but in previous boats they were a frequent destination. It will be good to see them again. 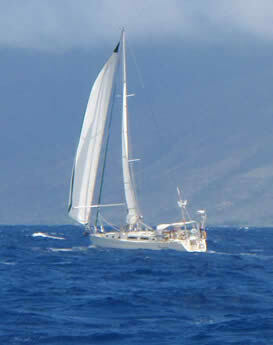 Here's a video we took on passage between Molokai and Oahu -- That's Diamond Head in the distance!